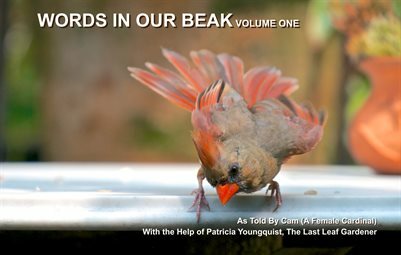 The Last Leaf Gardener: Tuesday's Truths, The Thirty-Fifth Week: Mournings "PLAY POSSUM"
Tuesday's Truths, The Thirty-Fifth Week: Mournings "PLAY POSSUM"
The image atop this entry shows a lone mourning dove in my garden, which as you may know, is on a "roof extension" in NYC. At first glance you might think that the dove has an injured wing which is exactly what he wants you to think! 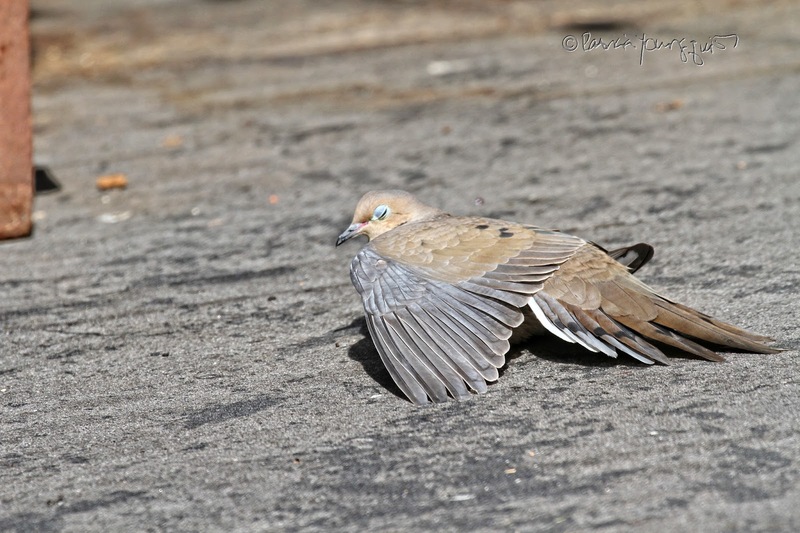 Doves do use the broken wing tactic to draw predators away from a nest site. Welcome to the thirty-fifth segment of Tuesday's Truths, where I will tell you a fact about this behavior known as the broken wing tactic. 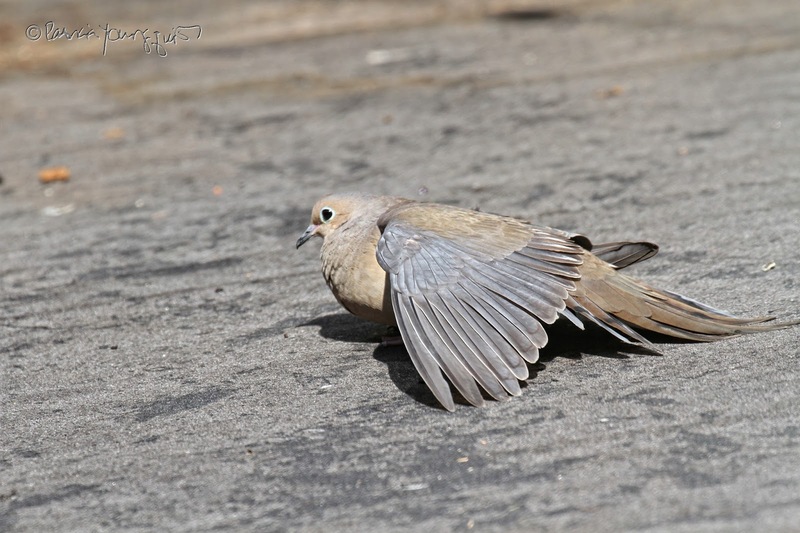 Young mourning doves are referred to as "squabs." And as an informative web-page states, squabs are "devoted parents rarely leave the nest or their young unattended. If danger is detected near them, they will perform nest-distraction displays, such as a broken-wing display, during which they flutter on the ground pretending to be injured and easy prey - to draw the predator's attention to them." When I see mourning doves doing this, I say they are playing possum. This is because "apparent death, colloquially known as playing dead, feigning death, or playing possum, is a behavior in which an animal takes on the appearance of being dead. This form of animal deception is an adaptive behavior also known as tonic immobility or thanatosis. Apparent death can be used as a defense mechanism or as a form of aggressive mimicry, and occurs in a wide range of animals;" according to Wiki. However, my seeing the dove behave this way could also be that he may have been sunning himself, even though it was not that warm. WBU explains that a mourning dove's "instinct to sunbathe even when already heat-stressed, supports the idea that it’s not always to warm the body. Like humans they probably enjoy a few rays but their main reasons for sunning must be to keep their feathers in top shape. 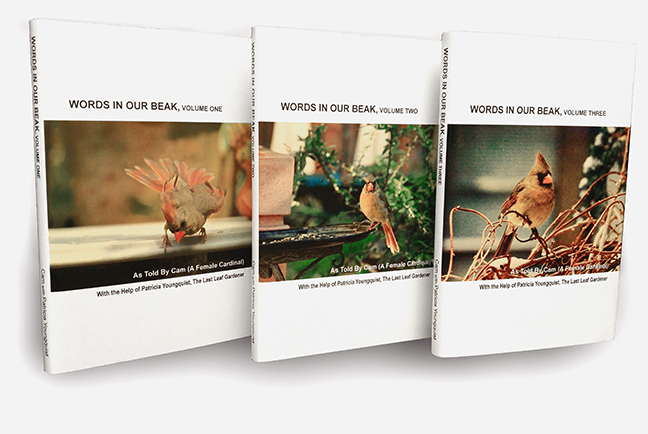 Some ways birds maintain feather quality is through water, dust, and sun bathing. 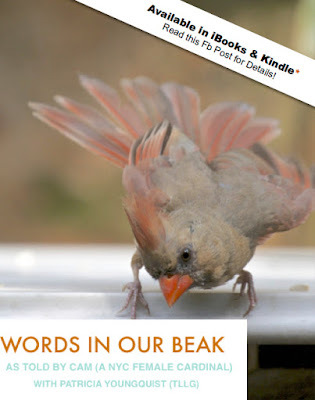 "Most birds have a preen gland or uropygial gland at the base of the tail. With their beak, birds realign the barbs correctly, remove any dirt or parasites and apply preen oil. If the bird sunbathes the oil is exposed to the ultraviolet light from the sun. Then the uropygial gland secretions convert to an active form of vitamin D which is ingested with the next preening. This may explain in part why some birds sunbathe. "However, doves don’t have the preen gland. Instead they grow powder down feathers that grow continuously and never molt. The barbs at the feather tips constantly disintegrate into a fine, talc-like, water-resistant powder. If you’ve ever seen a window strike by a dove, you may have seen a “ghost bird” on the glass. This is actually a tracing of the bird left on the glass by its powder down. "In late summer doves are growing new outer feathers. Like ironing our clothes, the heat of the sun might help make it easier for doves to shape their new feathers. And along with easing discomfort associated with molting, the sun may also help dislodge parasites so the bird can preen them off more easily." 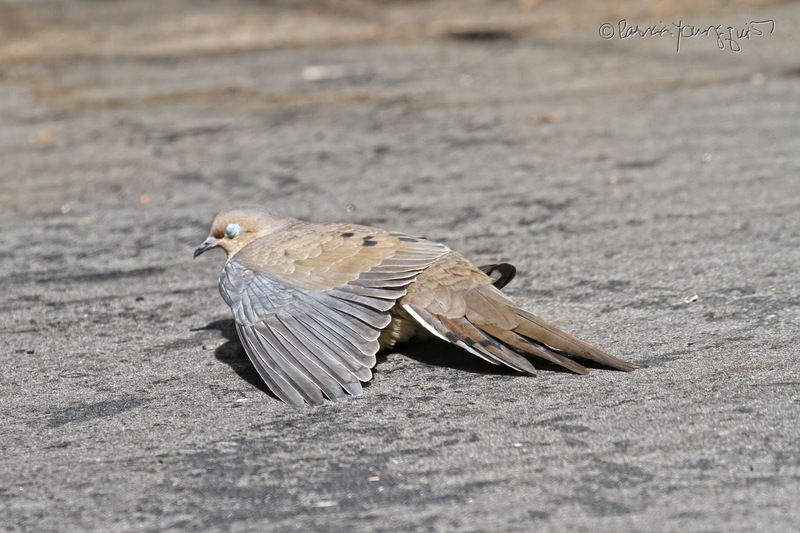 Perhaps the dove I saw was doing a bit of both: grabbing some Vitamin D while he could (as we've had very little sun); while feigning an injury so he could take a nap, as evidenced by his closed eyelids. 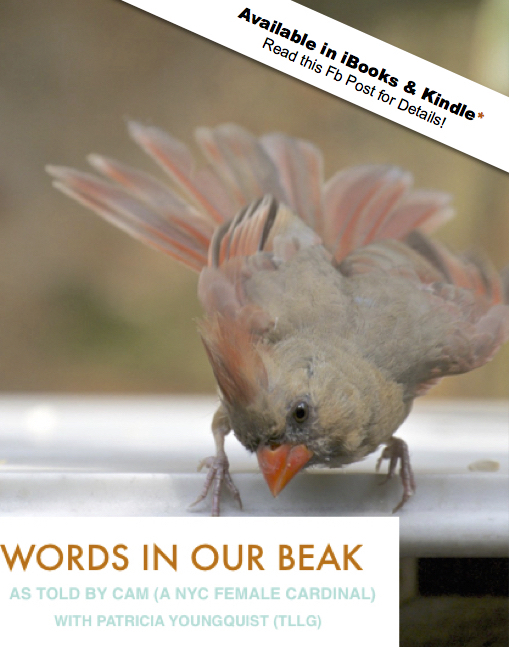 Julie Feinstein writes male and female mourning doves "have a small dark comma-shaped mark on both sides of the head below and behind the eyes. Their eyes are dark brown and ringed about with pastel blue skin. Their eyelids are blue, too -- one of my favorite things is to find a mourning dove asleep with its powder blue eyelids showing." 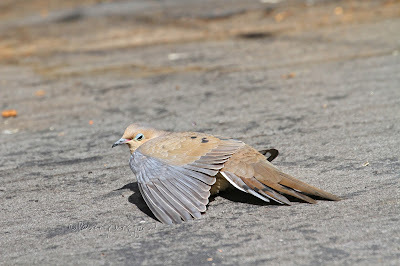 And I feel the same way way when I see mourning doves do this, it is peaceful sight. By the way, mourning doves have many fascinating aspects; and a number of their traits, along with beautiful photographs, are included in both the digital version (iBooks and ePub) as well as the hard-copy (soft-cover) version of the book Words In Our Beak Volume One. Either version makes to give if you happen to celebrate Easter or Passover, which are approaching soon! However, these books are a great thing to have, or to give to someone during anytime of year.